List of blog name generator services. These free online websites help you in finding a perfect and unique name for your new blog. Use these websites for getting some name suggestions! A couple of weeks ago I registered a new blog for a client. Selecting a perfect blog name is a task that must be carried out with due diligence. In the past, we published an article about the points that you should keep in mind while registering a blog domain name. I spent about one hour with my client to ponder over the blog name that will suit all his requirements. The name had to be small, unique, catchy, easy to pronounce, suitable for business… and available! In such scenarios, online blog name generators can come handy. In this article I am going to talk about a few blog name generators and how they can be of use to your quest for that perfect name! Everyone wants a unique name for their blog. But most of the time we find that the name we want has already been taken by someone else. Then we go on creating new words by combining and modifying words. These blog name generators help you coining new and unique names. A unique blog name helps you in creating your brand value. Professional bloggers should spend enough time on thinking about a suitable blog name. This is the very first step of building a killer blog. If you want your blog to make money, you have to be thoughtful on each of the steps in the process. So, if you’re planning to launch a new blog, read through this article and see if any of these blog name generators can help you. List of blog name generators. Provide a pattern: You can provide word(s) around which you want to name your blog. You can choose whether the word provided by you should come in the beginning, middle or the end of the suggested words. Length of the name: You can tell Wordroid about the length of the blog name that you’re looking for. Quality: You can select from high, medium or low quality word suggestions. Quality defines how name suggestions look, sound and feel. The higher the quality, the more they resemble the natural words of the selected languages. Home screen of NameThingy is minimally designed. The website announces that it provides blog name ideas (and names for anything for that matter). Originally, this service was started as a baby name suggestion service. But now it is equally used as a blog name generator. NameThingy asks you to select two categories from which you need a suggestion.For example, if you select Thing as first category and Music as second category, then NameThingy will suggest names like Suitor Brass. It keeps on flashing new combinations on screen. You can control that speed of name update. If you click on any of the suggested names, NameThingy will analyze the name if it is available for blog domain name registration. Did you know that Automattic (parent company of WordPress) acquired Lean Domain Search? It was logical for Automattic to do so because WordPress the biggest free blog making website. As expected from Automattic, the website of Lean Domain Search is pretty neat. You enter one or more keywords from you blog idea and the website generates a (very long) list of probable blog names. 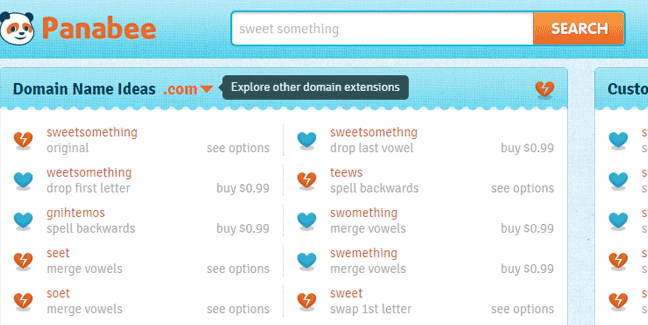 You can click on any of the suggested names and the website will inquire if that domain name is available. If the domain name is available, website offers you to register the domain name with popular domain registering companies like GoDaddy, BlueHost etc. The website also tells you if the Twitter handle by that name is available or not. SEO friendly: these names are suggested on the basis of what keywords are nowadays being searched more. At NameStation, you need to provide an email address before you can make a search for the available blog names. This is the biggest disadvantage of the website. NameStation takes a keyword from you and then generate a list of related blog names. After this, the service verifies whether the names in the suggested list are available as domain names. One good feature of this web service is that you can click on a suggested name and it can show you similar names. This helps in narrowing down your blog name search. You begin with a set of keywords and then NameStation suggests blog names. If you like any of these but want more variations of the same name, the NameStation service can do that for you in a jiffy. 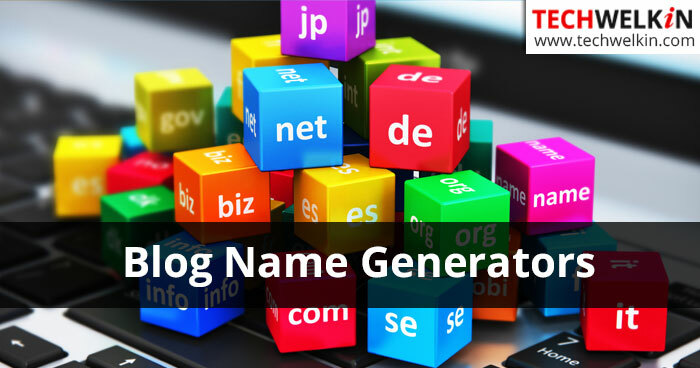 These were some of the most widely used blog name generator services. We hope the article was useful for you. Have you come across another good service for name suggestions? Please let us know in the comments. Thank you for using TechWelkin. Yes, Siddharth, it is indeed pretty difficult nowadays to get your favorite blog name. People have purchased all sorts of domain names and they are not even using them! Guess, they just hope that one day somebody will pay handsome amount in exchange of a domain name they are holding on to.